Black Diamond ATC-Alpine Guide Belay / Rappel Device. A more compact, lighter version of BD's versatile ATC-Guide, the ATC-Alpine Guide is At just 73 grams, this featherweight belay/rappel device is optimized for ropes between 8.1 and 8.5 millimeters in diameter yet works with ropes from 6.9 to 9mm. 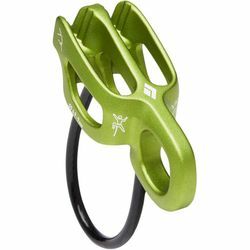 The oval-ized anchor-hole allows for easy feeding and pulling of rope, and the device's guide mode lets you belay one or two seconding climbers off an anchor. Multiple friction modes provide the optimal amount of stopping power when lowering or rappelling.